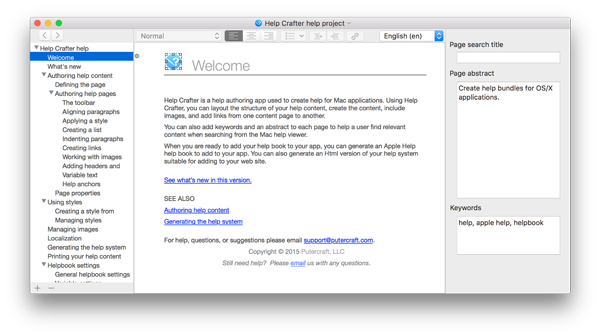 [prMac.com] Seattle, Washington - Putercraft is pleased to announce the release of Help Crafter 2.0, their help content authoring tool for Mac OS X. Let's face it, sometimes users need help with even the best designed applications, and including well written help is a must. Unfortunately, there were few Mac based tools to help, and putting together a functioning help bundle is not trivial. As one reviewer in the Mac App Store wrote: "There's a reason a lot of Mac apps in the app store don't have Mac Help files - it's because the process is one of THE most terrifyingly painful things for a developer to have to do." This all changed with the arrival of Help Crafter in June 2015. The reviewer above continues: "This app takes away most of the pain, thankfully." Another reviewer wrote: "Finally a real HAT for Apple Help". Authoring help in Help Crafter is as easy as using your favorite word processor, and you don't need to understand how to assembly the help bundle. You can even create multi-language help bundles if you need to support multiple languages. Even better, you can export your project as HTML to include on your web site. "We've been hearing a lot of good things about our initial releases, and we listened to customers to find out what they wanted from their HAT. We're very pleased to offer this update that includes many of the top requests," said Jeff Pearce, co-founder of Putercraft LLC. Help Crafter 2.0 is $49.99 USD (or an equivalent amount in other currencies), and is available worldwide exclusively through the Mac App Store in the Developer Tools category. Putercraft LLC was founded in Seattle, Washington in 2014. Putercraft is the maker of Help Crafter, the best way to author help content for your Mac Applications. Our goal is be the easiest way to author beautiful help on a Mac. All Material and Software (C) Copyright Putercraft LLC. All Rights Reserved. Apple, the Apple logo, Macintosh and Mac OS X are registered trademarks of Apple Inc. in the U.S. and/or other countries. Other trademarks and registered trademarks may be the property of their respective owners.